These would have to be one of my most favourite 'quick' things to make (sorry to all my friends who always get me bringing these when I visit!). I really do have a sweet tooth. An extra bonus is that these truffles are also gluten free, which is great for those gluten free visitors that you sometimes have (well, I do anyway). Melt butter and mix all together with the essence. 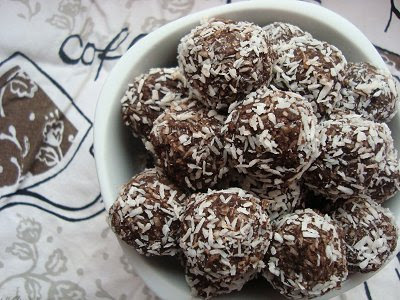 Roll into balls and cover in extra coconut or melted chocolate. And there you go... sweet and simple. See here for my other truffle posts. Wow they look amazing and the picture is great as well. My poor darling! I might just have to whip up some for you sometime this week!!! 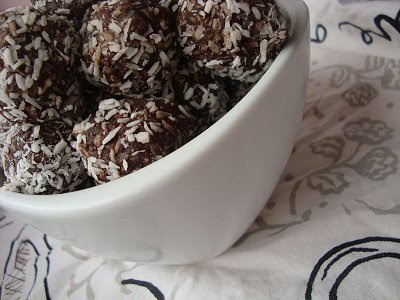 Yum, I have your licorice truffles at the back of mind to try one day! hmmmmm. Licorice and chocolate together can only mean good things! Do you have a truffle recipe without cocoa? I have a cocoa allergy!! McQuoid Clan - sorry I don't! Have you tried coconut ice rolled into balls? I might just have to list that recipe next! Have you tried these with crushed Wine biscuits and a little heated up apricot jam? It makes them go a lot further and takes the edge off the sweetness! My FAVE! !